Light brown belt with deer buckle motif. Gorgeous traditional light brown german belt. Pure natural leather in a beautiful mottled tan colour, with a fancy buckle as a centrepiece. 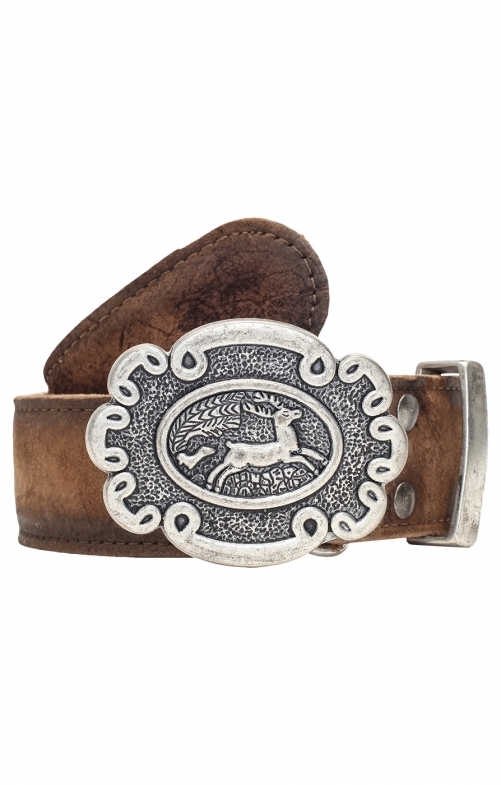 The silver coloured buckle depicts a prancing deer in the woodlands. Goes very well with the other traditional garments from this site, or with jeans for a more modern, laid back look. You will not be disappointed! Available in various sizes. To find out which is best for you, take a belt that fits you well, and measure from the buckle to the hole you use. Buy this belt in the length closest to the result. Es wäre ganz hilfreich, wenn die Breite des Gürtels angegeben wäre, dann weiß man bei der Bestellung schon ob er in die Ösen passt. Klasse Material, ebenfalls die Verarbeitung einfach klasse. Gütel wie auf Abbildung, sehr robust zu dem Preis empfehlenswert. Schöner Gürtel,für den Preis OK. Uumtausch in eine andere Größe ohne Probleme möglich.